I like going to camp grounds and forest preserves and the such. The bathrooms at those types of places can be very frightening though. Sometimes it’s not what other visitors have done in there before you it’s the hundreds and hundreds of bugs. I think I have to go take a shower now. I was at a rock festival last weekend. Imagine 80k people using portable toilets for a long weekend. They got cleaned and a half hour later they were just nasty again. But such are the woes of a festival. Ewwwww, this gives me shivers just thinking about it. 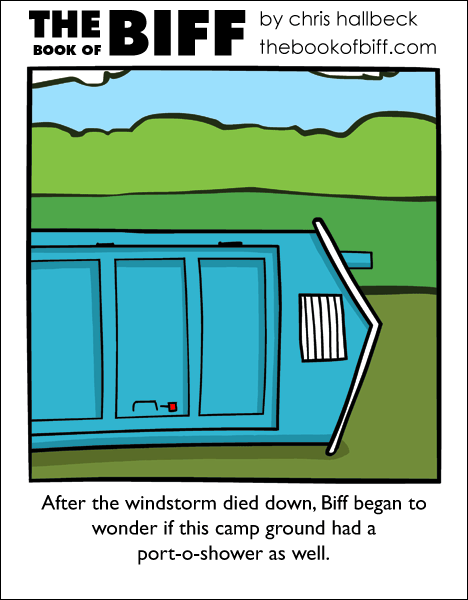 I feel so sorry for Biff. Aw man! It’s everywhere! It’s in my melon wounds! You have my sympathy, ladies. Chris I must say that you have a great comic and that I can’t wait for all the Biffs to come! (and Dooley, by chance, did you go to Graspop Metal Meeting? Heh. Imagine a lot of Society for Creative Anachronism people using port-a-potties for a weekend. And this is after days of eating medieval foods, which…well, let’s say the results aren’t pleasant. Chris, you’ve just revived some of my worst nightmares. Can I join you in that shower? Biff should install a drive-up window and sell fast food. I just wanted to let you know that I literally just spent most of my one free day this week getting my addicted to yet another webcomic. Genius, man. You’re a riot. I don’t remeber what other comic I was reading linked me here, but I’m glad it did. Maybe it was quesitonable content. or dr. mcninja. I’m not really sure. But you’ve got talent. I’ve enjoyed reading. It was propably QC. There’s a Biff ad in the Project Wonderful box at the moment. *Shudder* That brings back the memories of my dad flying model airplanes in the middle of huge fields with no running water for miles. The only porta-potty had a hornet’s nest in it and smelled like god knows what. I only came when I had to. Actually, I’m with Kuroiten in the SCA. Really, they aren’t too horrible if they get cleaned regularly. At one SCA event in my area, Porta’s are the only bathroom facilities for ~1500 people for ten days. Yay Lilies! For bugs, all you really need to do is look up and down; 95% of the biting/stinging bugs you’ll encounter in a Porta will either be on the floor or the roof. Actually, I think that’s happened before at Lilies with someone in it. Might have been Pennsic though. Bah, don’t remember. Still, I use them as little as possible, personally. Yuck…My shower tickles me, so I can’t use it. Woo, finally reached the newest comic! I agree, this website really needs an archive page.. I work in a chemical refinery, and as a high level contractor, i cant say the name but the itintials are Don’t Over Work…. anyways keeping yourself away from chemicals is very important…. I did not realise how much so until i read what somone had wrote inside the porta-john. It said ” All personal releases longer than six inches must be hand lowered to avoid chemical splash.” To whoever penned that statement….. friggin cudos man…. Cudos. I have to thank project wonderful as I would have never read it otherwise. Looking forward to ordering the book soon. that happened to a friend of mine TWICE. only the first time, it was less the wind, and more me and another friend barreling into it. I’m surprised he’s still my friend. I hope he has a knife to cut his way out with! Oh dear god I’ve got corn all over me! I didn’t even have corn for dinner last night! Funny stuff man, funny stuff. My dad told me some funny stories about porta johns back when he worked on bridge construction. One day the cleaning crews were cleaning out the porta john at his job site and almost all the crew was waiting for them to finish, you know, use the thing before it gets completely filthy. Well, just as they finish up, some new guy there cuts in front of everybody and locks himself in the porta john. You don’t cut in front of about 10 people waiting to use the john. Dad said all ten of them there picked up the porta john and slung it to the ground door down. He said it took that guy 20 minutes to get out of there and he was covered in that blue chemical stuff from his armpits to his boots. this reinds me of that one part of that one episode of family guy……. We did this to a kid in cadets once, tho I will add that he did deserve it. I know a lot of people who deserve it, but i’d chain it shut. Who watched the dirty jobs where Mike took a day off? What I’ve done is back a car up to the door so it holds it shut. Funny stuff. Last event I went to, someone made a sport out of toppling the portaloos over with people still inside. The results were hilarious, but I sorta pitied the poor fellows inside. One girl came out with a turd on her shoulder. Ya know, this happened to Chester, from Linkin Park. XD He was usin’ a porto-pottie, and the other guys started rocking it to freak him out, and it ended up tipping. XD Poor guy. Silly Biff! That is why you andhor your porta potty before entering. *Shudder* i can barely use public bathrooms. its not the germ thing-altho if i let my self think about it i end up washing myself about 400 times untill i forget agaid– but its the fact that other people are in the bathroom with me…0.o…they are right there…. a complete stranger is hearing me….its creepy to no ends in my mind. but Porta-toilets?? no freakin way ever. I was eating when I read this. Chili con carne. Extra mushy.